Justin and I have had a bit of a crazy week with family visiting from out of town. 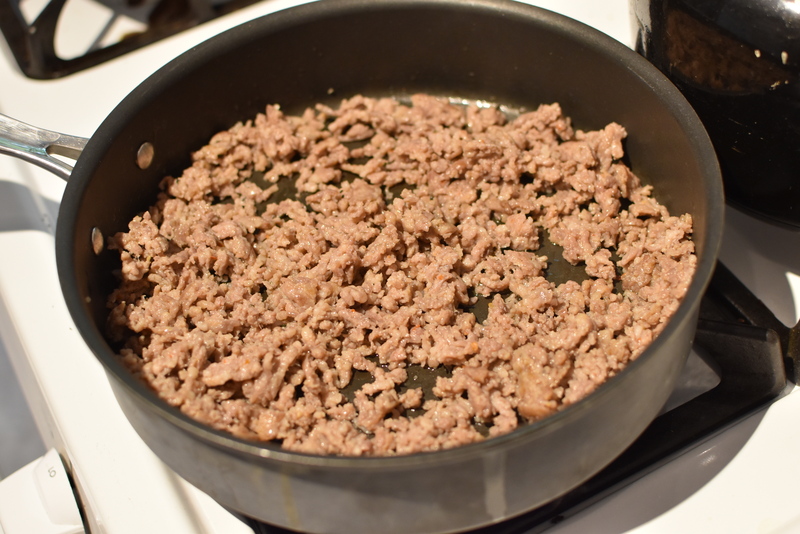 At the end of it all, I really just wanted to cook a healthy, homemade meal from scratch. 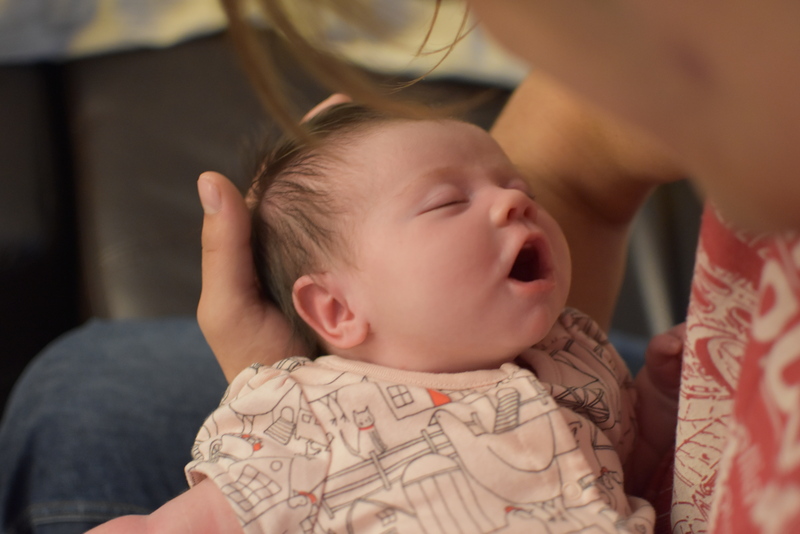 In between baby feedings, that’s exactly what I did. 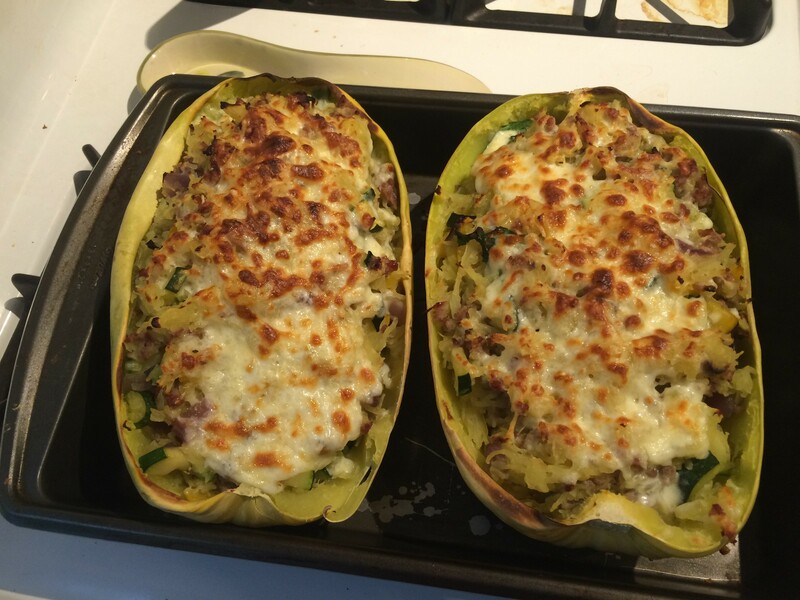 First things first, I got hubby to cut the spaghetti squash in two. Next, I scooped out all the seeds. 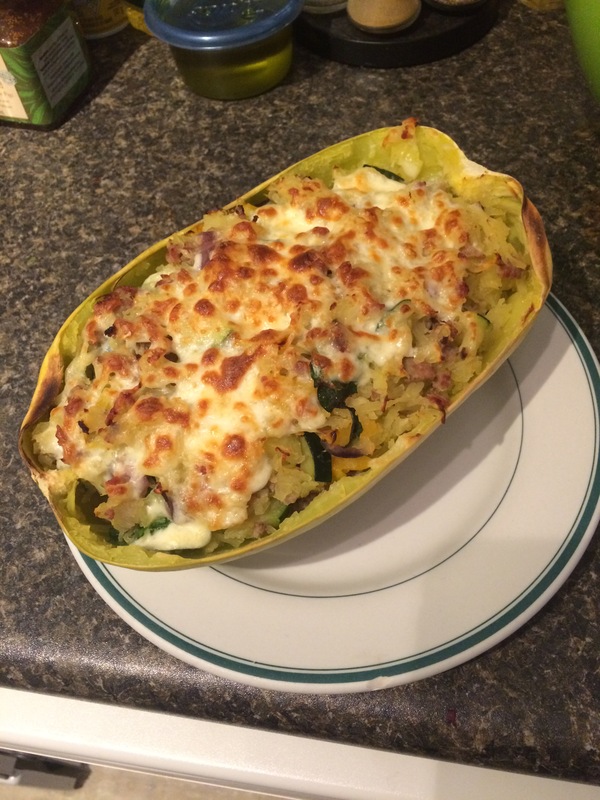 I used the cheater method to cook the squash: In the microwave. I had never done it before, and it was super simple! All you do is lay it face down in about an inch of water in a microwave-safe dish, then you microwave it on high for about 15 mins. It sure beats taking hours in the oven. I don’t think I’ll cook squash another way again! 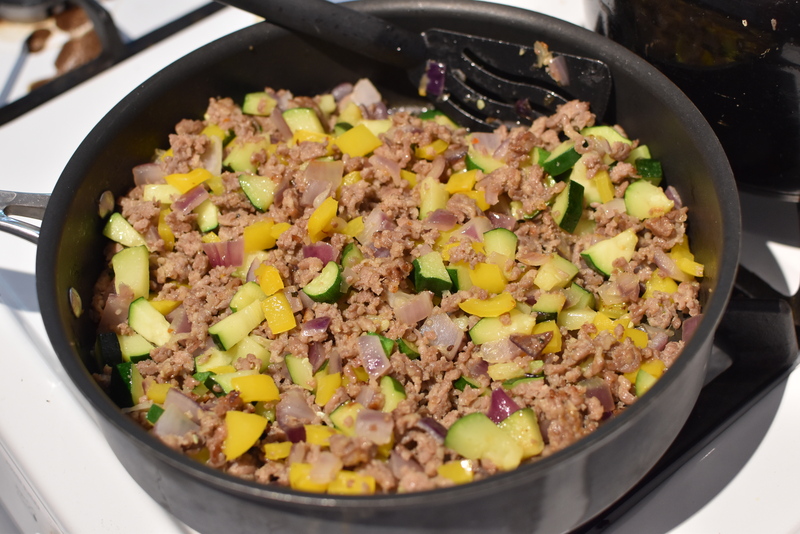 For the filling, I used mild Italian sausage, red onion, peppers and zucchini. I cooked the sausage first. Then I added the other veggies. 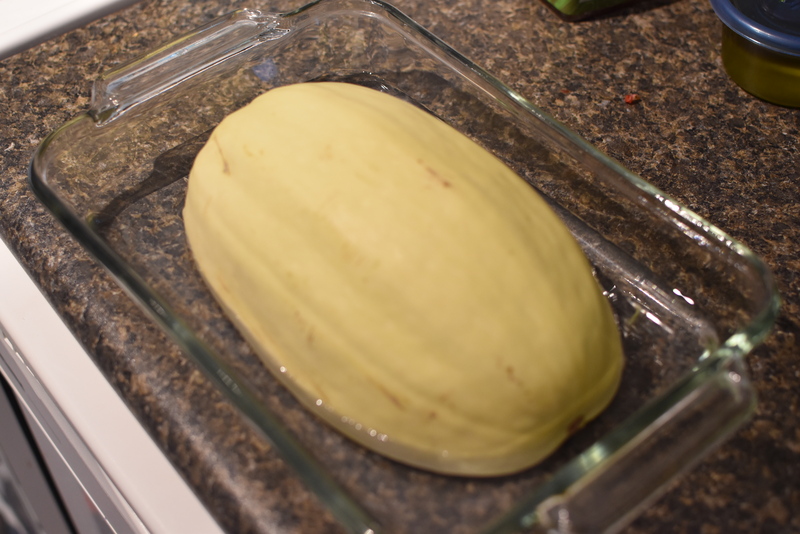 Here’s how the squash looked when it was all cooked. You can tell it’s done by poking the flesh with a fork. It should be nice and tender, and should shred easily. 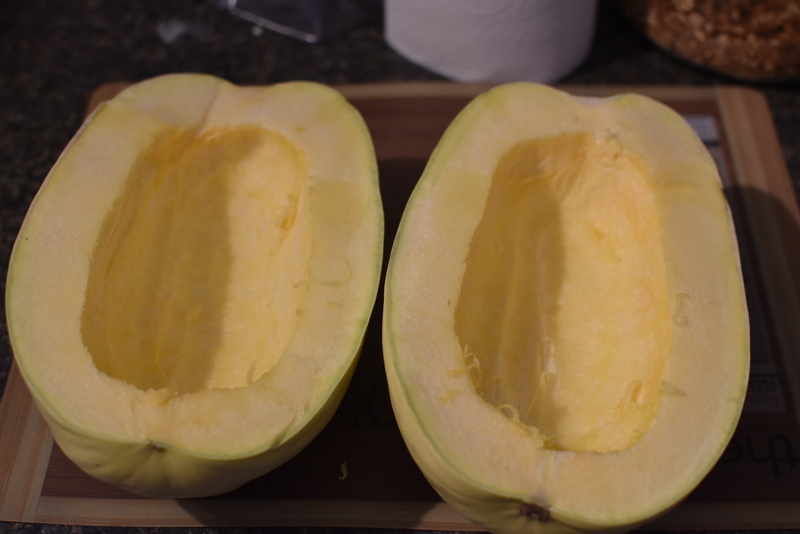 Next, scoop out the inside of the squash and pop it into a bowl. 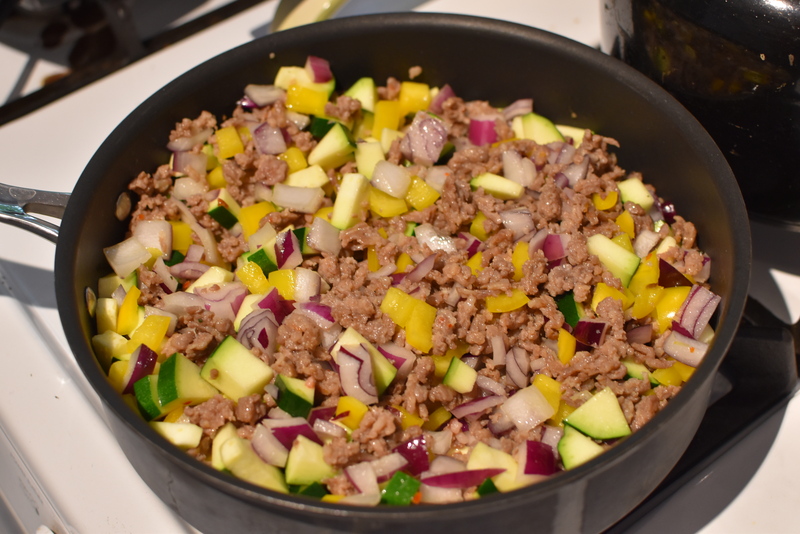 Here’s the filling, all ready to be mixed in with the squash. I threw everything into a bowl with a handful of spinach, and mixed it all together. I also broiled the cheese for about two minutes on high, to get that extra crispy, golden top. Serve it nice and hot for a delicious fall meal. Begin by cutting your squash in half. Scoop out the seeds and place one half face down in a microwave safe dish in about an inch of water. Microwave on high for about 15 mins. 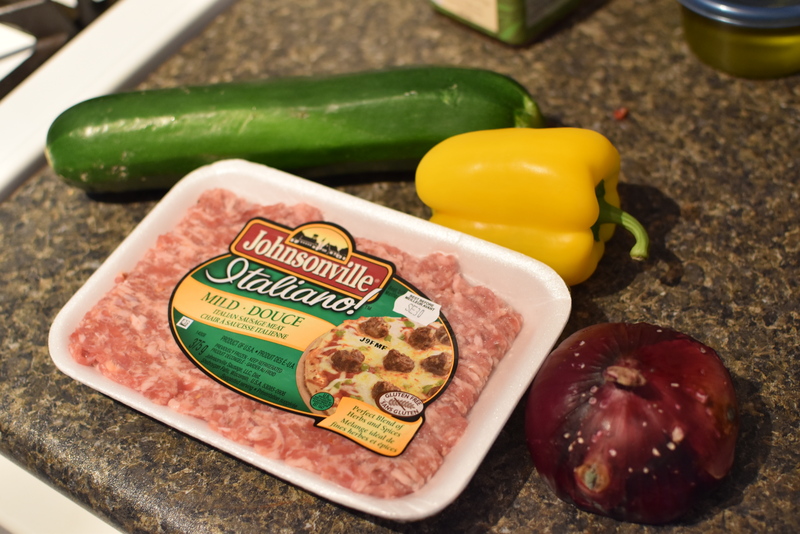 While your squash is cooking, dice up your veggies and cook the sausage in a large skillet. Add the veggies and saute until all veggies are cooked. 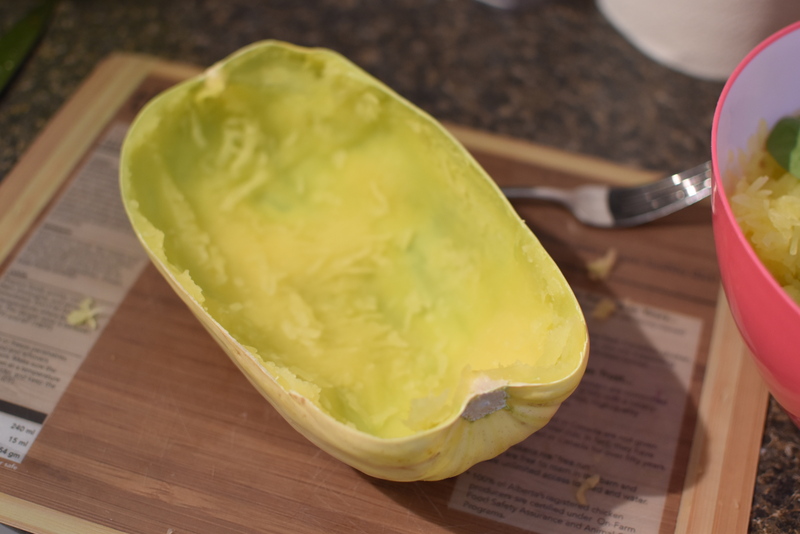 While preparing the filling, keep an eye on your squash in the microwave. 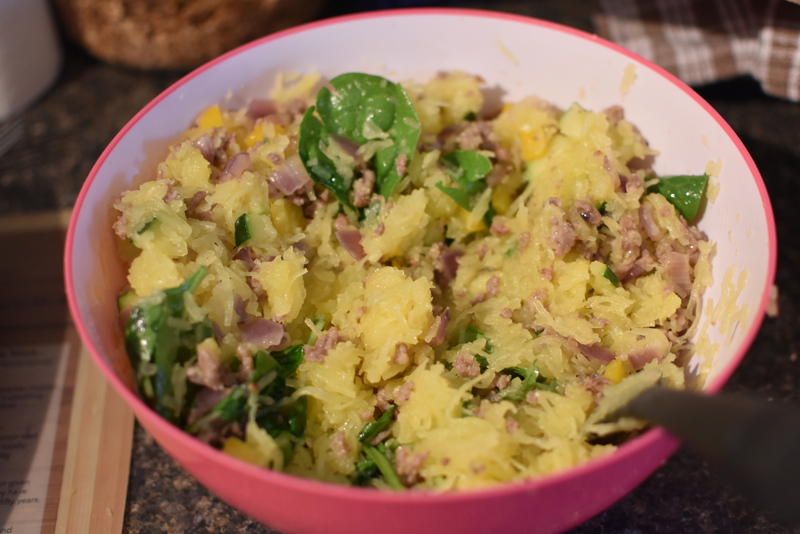 Your squash is fully cooked when the flesh can easily be pierced with a fork and shreds easily with a fork as well. 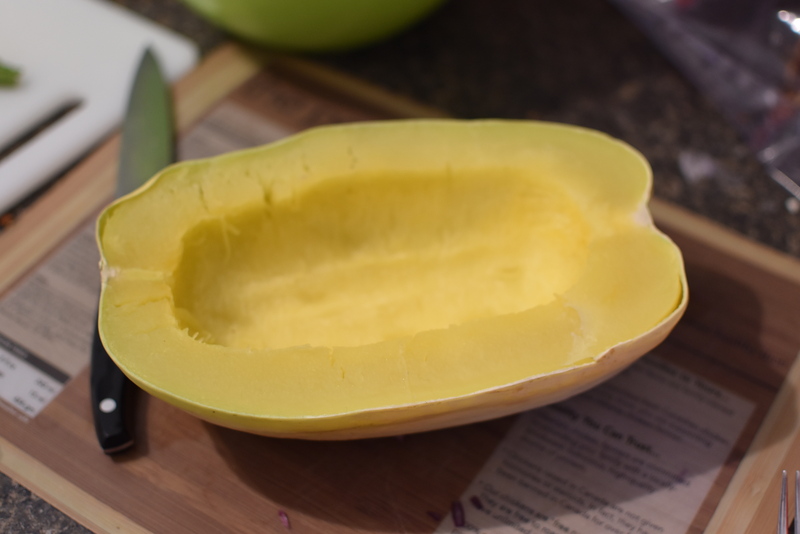 Scoop out the insides of the squash and transfer to a bowl. 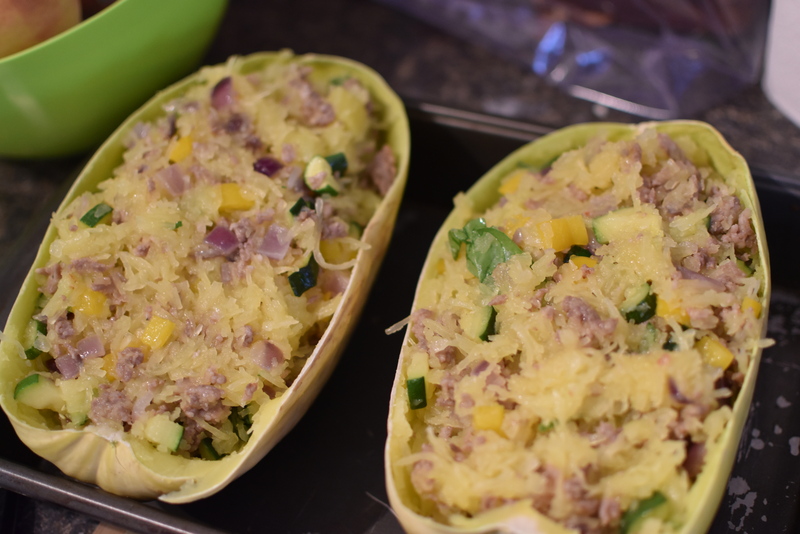 Throw in a handful of baby spinach leaves and mix the filling in with the squash. 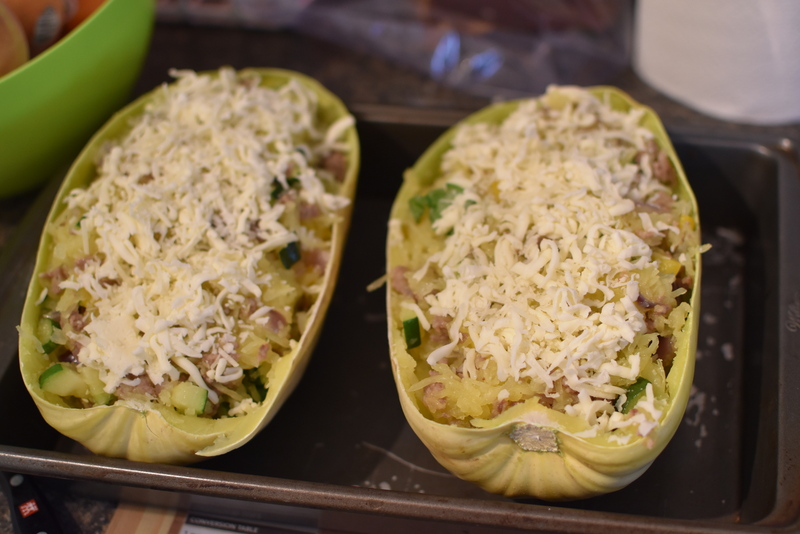 Transfer back to the squash shells and top with cheese. Baked at 375 for about 20 mins (or until cheese is melty and golden.) Serve nice and hot! Tis the season for a lovely harvest! 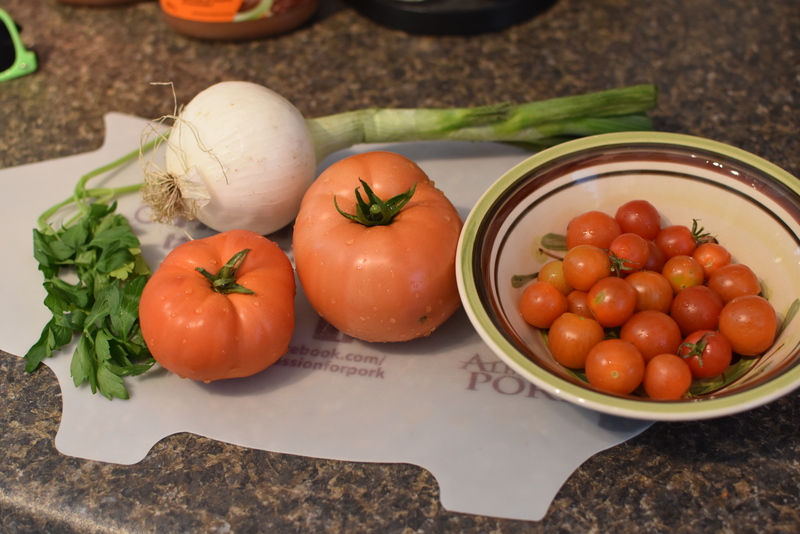 Justin and I have been so lucky to be able to collect a huge amount of tomatoes this year- and we only planted two plants! We invested in a sweet million and a Druvba (a polish heirloom variety). 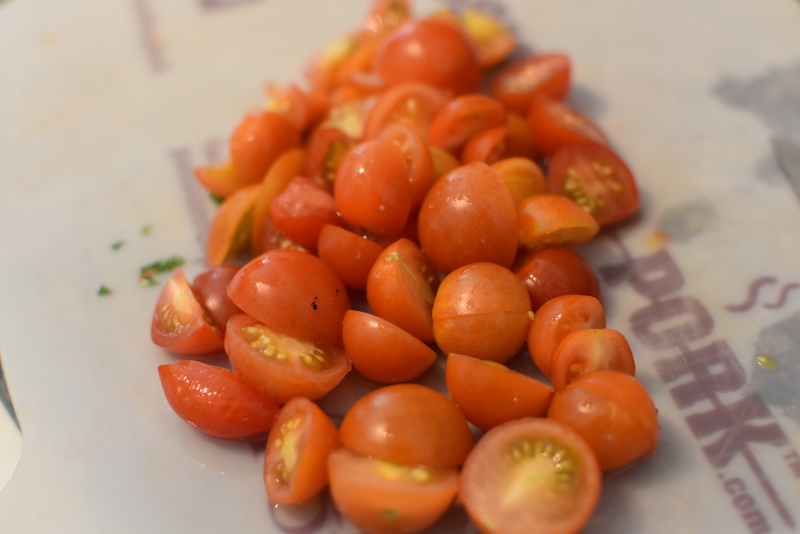 With so many tomatoes, I decided to make a tasty bruschetta one day! They are even more beautiful when you chop them all up! 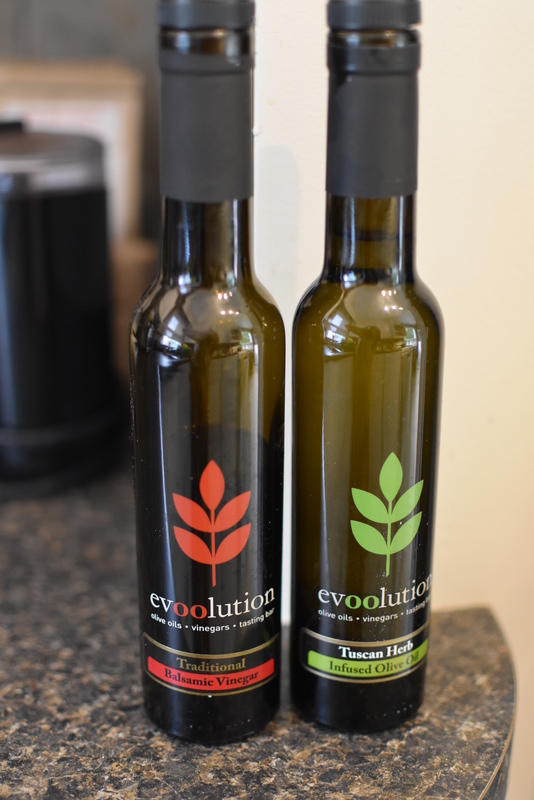 For this recipe, I used the traditional balsamic vinegar and the Tuscan herbs olive oil from Evoolution. Seriously tasty stuff! I chopped up all of the ingredients and let them sit for a few hours in the fridge. The longer you let it sit, the better the flavours meld! 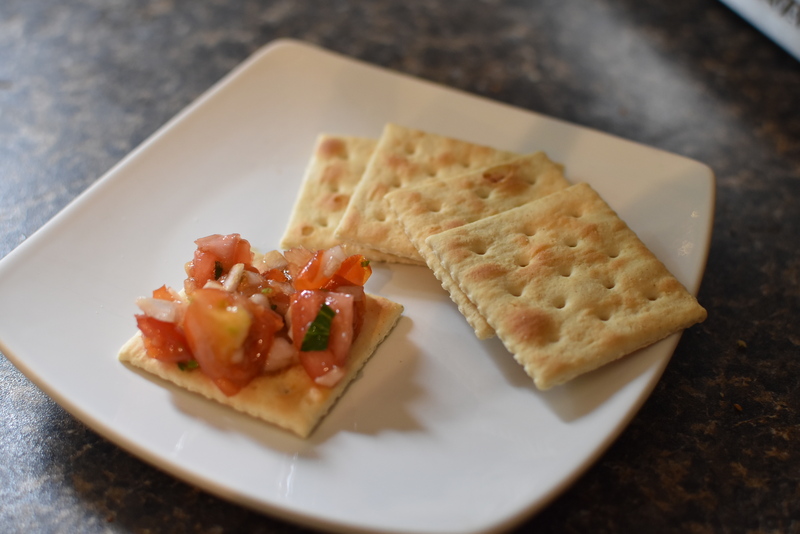 Serve with crackers or on a toasted baguette! I can’t wait to make recipes like this for my little Anna one day! 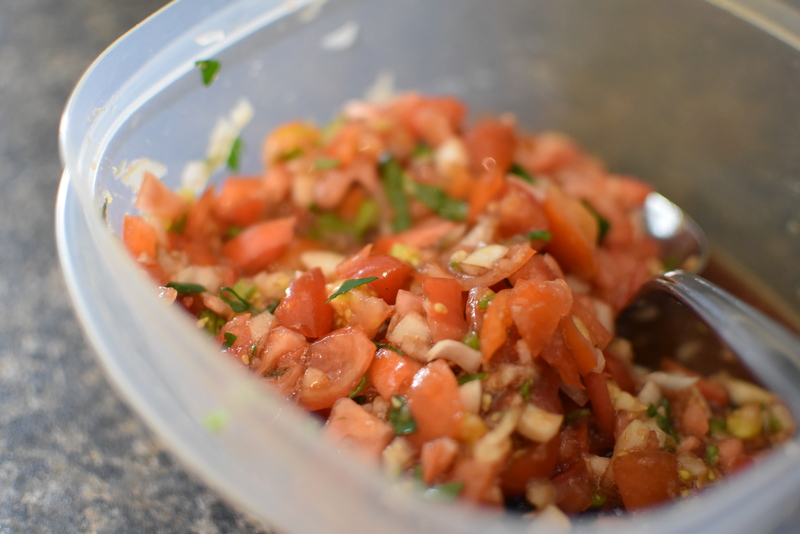 Mince your tomatoes, onion, garlic and basil leaves and add them to a bowl. Add balsamic vinegar and olive oil and stir thoroughly to combine. Let sit in the fridge for at least an hour before serving with crackers or on a toasted baguette. Enjoy!